Maria Grazia Cavaliere graduated in Chemistry at the University of Pisa (Italy). 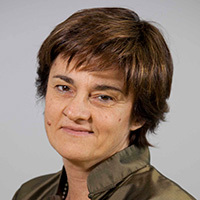 In 1986, she joined ENI group, where she developed her professional experience, focusing on different aspects of the thermoplastic elastomers (TPR) business. She progressed through various positions in R&D, Technical Service, Sales and Marketing. Maria is now responsible for TPR Technical Service in Versalis SpA, Business Unit Elastomers. The polymers used in hotmelt adhesive (HMA) formulations are specific thermoplastic materials constituting the backbone of any HMA. Therefore, they play a fundamental role and have a large effect on the rheological and viscoelastic properties of the adhesive. Styrenic block copolymers (SBC) are widely used in HMA thanks to their versatility and compatibility with oils, resins and other components. Moreover, they guarantee cohesion and elasticity to the adhesive formulations. In this work, the performance of HMA formulations representative for non-wovens, are investigated with reference to di-block content of SBC at 40 % of styrene. Moreover, SBC obtained via coupling or sequential monomer addition are examined. DMA, creep testing and technological properties (e.g. Brookfield viscosity, SAFT, HP) are reported showing good processability combined with high performances of the HMA in service.